The funny thing is that I thought this was a real story (after reading the headline) until I remembered what day it was. I wonder if the Bible includes a tear-away form so you can write down your bank account number and send it in to your local 501(c)(3). This project has been a long time coming. Now SBC megachurch pastors will have the perfect translation to thump over the heads of congregants and help finance their next Lear jet. Please tell me this April fools...please. Very funny post, but not that far off of the mark. Robert Morris has paid 70 staff members including 32 PhD's to work on a new translation of the bible called The Tree of Life Bible (TLV). It's supposed to be for Messianic Jews. No word yet on its position on new covenant tithing. Perhaps he's already got that covered in the TLV. If not, look for Morris to hire even more "real" PhD's (see http://www.patheos.com/blogs/warrenthrockmorton/2015/03/30/gateway-church-pastor-robert-morris-claims-to-hold-a-doctorate-of-literature/ re: Morris' fake doctorate) using tither's money to create yet another translation of the bible. This is the first and probably last time I will visit your site. I was expecting truth. A lie in the form of an 'April Fool' joke is still a lie. A disclaimer at the beginning would have been appropriate. Waaa, waaa, waaaaa!!! The point is this is a mixture or truth and farce. Hyperlinks in this article take you to video documentation of things these men have said that WOULD lead you to think this could be true. I think it is hilarious!! Besides, for most evangelicals the source of "truth" relied upon is "Pastor", not "Watchdog"
I'll bet that same anon has no problem with Caner lying for a decade. But a joke he has problems with. Give me a break! Anon was probably upset because he wanted to buy a copy. 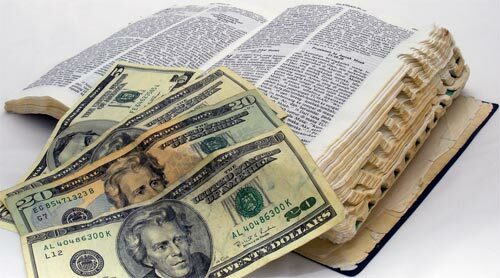 Maybe if you gave more they could afford to produce this Bible. That one was too funny! insults that often are found in comments on this subject. Really? How silly, it was a joke. With April 15th rapidly closing in on us, I was thinking. Pastors, if you really want to do something to radically help the members of your congregation, tell them to pay their taxes instead of giving to the church. Not only will this help your church in the long run; there is a failure to pay penalty of up to 25% so ultimately your members will have more to give; but it will also relieve the stress and strain on your members from owing money to the IRS and it will save marriages. God calls us to give generously but he also calls us to not be wasteful and stupid. Pay your taxes, Jesus did. Umm Please someone kindly tell me I'm having a bad dream. Throw some cold water on me or something. I hope to God above this is a April FOOLS joke NOT that it isn't totally believable. You are gross Robert Morris for your atrocious mishandling of God's Holy Word with your so called Revised Storehouse Tithing whatever, whatever. I won't even call it bible as you and all the others with you who endorse such a grotesque interpretation of Gods True, pure and Holy Word that He has given us to teach, encourage guide, direct, correct and all other words to that effect!!! You and all others that are involved in this perverse wording of His Holy Truth WILL give account when each of you stand ALONE before Him! READ HIS WORD REGARDING WHAT YOU HAVE DONE (TO HIM! For He is The Living Word!) Not Only IN BOOK OF REVELATION. Seems like you lost the Fear Of The Lord. May He have mercy on all of you! May our Lord have mercy on you. Dog, why don't you just go ahead and come out as a non-Christian. Come on, you know you want to do it, and it's pretty obvious to anyone who's been reading you for any length of time.